Post and Read about DYI Suspension upgrades here! Ordered Ohlins cartridges and shock today. Fitted a new basic YSS rear shock absorber, a better way ? Pattonme (Matt) No Longer, What Option Now? SKF fork seals and dust seal - yucky green but good? 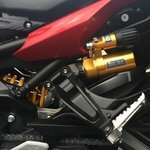 Suspension upgrades on a budget?